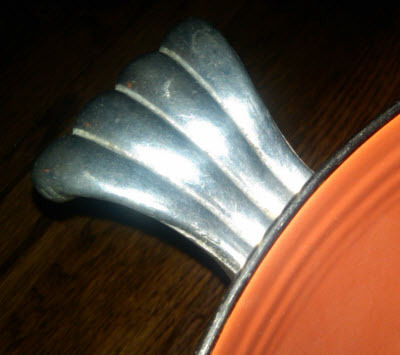 Bouge Blog: Can a colander be cool? Can a colander be cool? hy not? If you search around hard enough there are lots of simple treasures to be had. When I searched for a new colander, I began by looking at some antique ones. I found a few colanders that were from the 18th and 19th centuries that were stunning - stoneware beauty that would last another couple hundred years for sure. But the shape was wrong for practical use, and I wanted to practically use them. I kept on. 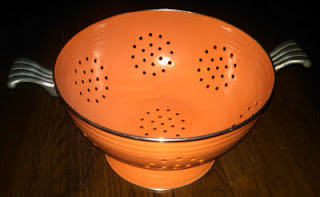 At last I found what I was looking for - a simple colander with the traditional shape and enamel over steel construction.....all with an added "extra" to make it special. The designer was the Homer Laughlin China Company - the same one from the 1880s - but they had licensed their design to a production company in Thailand. During the 1930s, when the more affluent crowd was snatching up the last of the Fairyland line, the average Joe was buying Homer Laughlin's "Fiestaware" - simple porcelain dishes in nice shapes and a variety of outlandish colors. It was relatively cheap, fun, and took some of the sting out of what was probably some pretty meager meals. The company went strong until the late fifties when, due to cheap imports, it moved it's dinnerware operations over to the food service industry and stopped catering to consumers. Under consolidated management in early 2000, the company took a risk after looking at the new interest from collectors. They began to license their designs to companies that were interested in the "look" of their china; offsetting risk to the production companies. It worked, and their revived "Fiesta" line came back. My colander is from this line; which was limited and is now out of production again. You can find some really neat pieces of the original Fiestaware on eBay and in antique shops and flea markets. It's fun and it doesn't cost a fortune. Beyond the fun colors, the new production had some of the same lines as the originals that everyone knows and loves. On my colander, the detail was added to the scalloped handles, and the chrome finish suits their myriad of colors quite well. What I wasn't quite prepared for was the physical size of the one I got - large enough to strain pasta for ten. I believe there are smaller versions out there, and I'll keep an eye out for those. While trolling aroung and reading about this, I found a video from Homer Laughlin's archives of some original footage of how the pottery was made. It's really quite cool, despite the horrific music. When I get my main computer back from the dead, I'll strip out the music entirely or replace it with something more appropriate. For now, just mute the sound and enjoy. A simple concept, a complex mess. There's cameras, then there's cameras. Part 1.